I haven’t been in the workforce long enough to experience any severe discrimination but if and when that happens, one part of my response will be influenced by an upcoming Supreme Court decision based on protecting employees from employer retaliation after that employee files a discrimination complaint. The defendant, Sheila White, did not have her pay disrupted until she filed a sexual discrimination complaint with the Equal Employment Opportunity Commission. Burlington Northern eventually changed its mind and compensated Sheila for back pay. That’s interesting because I wonder how many of those complaints are filed by women and minorities? However, this case is an interesting chapter in the on-going tug-of-war between employers and employees. Now let’s assume you are susceptible to discrimination because of something silly as the color of your skin. And let’s further suppose you have three kids and a mortgage, how far would you push for civil and equal treatment knowing that your work-life could very easily become non-existent or extremely uncomfortable? Your answer to this question no doubt will be affected by this decision because if you know that your employer can get away with discrimination and then force you out of your job if you file a complaint, then I would think that you would not push as hard. However, if you knew that you could sue your employer twice for retaliating against your original discrimination complaint, I imagine you would be a little bolder in speaking out. Ideally, everyone would speak truth to power whenever they see it, but I am aware that this thinking tends to fade over time. So maybe if the Supreme Court rules in favor of Sheila, then those who are really beholden to their jobs might muster enough courage to speak up for what’s right. And for as difficult as it is to actually prove discrimination, I hope the Supreme Court will not give employers the power to muffle the cries for justice. I have been pondering the current ramifications of the immigration debate and I have come up with more questions than answers. And unfortunately, I am no where as near well-versed on this issue as I would like to be. But I would like to take some time to at least steer us in the right direction. For starters, (this applies to any issue) we have to pay strict attention to the way in which language is used to frame a debate. When commentators use the words, “alien” and “illegal,” the ensuing argument already assumes its own conclusion. And to call someone an “illegal” is just plain ignorant. I heard a guy on NPR ask, “Why don’t we call Martha Stewart an illegal CEO after she was indicted?” Similarly, if you ever had to go to court to contest a speeding ticket, the bailiff or judge doesn’t label you as an illegal driver. So why are so many of us so comfortable with using this term with respect to Latinos? If we are going to have an intelligent debate, we need to create language that is clear and respectful to both sides. You know what is killing me about all of these Black commentators talking about how Latinos are taking away jobs is baffling. I say that because like most Black folk (perhaps with the exception of those living in the Southwest) never seriously thought or wrote about immigration policy. But now, poll numbers show that Blacks and the rest of the country consider immigration policy to be an important national issue. Did you ever once consider that maybe this immigration debate is a convenient distraction for Bush and the Republicans to not talk about the ongoing civil war in Iraq? Not to mention that while Iran is upping the ante, our national government is obsessing over immigration. So for all the Black writers who recently discovered the importance of immigration reform, go back to what you were writing before instead of taking your talking/writing points from the mainstream press establishment. Another thing that perplexes me is Black commentator’s assertion that we can’t let “illegal immigrants” sneak into our country. I don’t need to get into the nuances of why Black people may not have the warmest affection for America, but I condemn anyone that will use racism/discrimination to solidify their patriotic ideals. Because when Katrina survivors STILL can’t depend on FEMA to help them and when our country ignores the plight of those in Darfur, Black patriotism for America is hard to find. I know Americans are notorious for lacking an appreciation of history, but why hasn’t Manifest Destiny or the Mexican-American war of 1846 informed the immigration debate? To be sure, the US “conquered and held California and New Mexico during the U.S.-Mexican War. The nation also obtained vast cessions from Native American tribes, which were relocated to remote and unwanted regions, a process begun in the seventeenth century.” Therefore, it seems to me that for as complex as the current debate has become, it would be a little easier to understand if we put it in the context of real American history. And I haven’t heard anyone talk about the vast numbers of West Indians (I am speaking generally, of course) that are patiently awaiting their green card. So my gripe with Bush’s proposed guest worker program is that I wonder how much easier it would be for Mexicans and other Latinos to participate in this program than it would be for West Indians. Again, a historic note would be fitting because if you really think that people would be trying to keep Elian Gonzalez here if he was a Jamaican, then you are seriously mistaken. My hope is that immigration reform should be just as easy to take advantage of as Mexicans or West Indians, or any one else who wants to come to this country. More importantly, letting people work illegally without any intentions of granting them citizenship is just wrong. And for all the people talking about how illegal immigration closes job opportunities for Blacks is narrow-minded at best. We see the same flawed logic used in affirmative action when people imagine two applicants where one White applicant directly competes against a Black applicant who has lower credentials. The fact is that college admissions, like the economy, is dynamic and the market place (with healthy assistance from the government interference) and therefore, cannot be simplified to one Black and one Latino competing for one job. The fact is that if American corporations were more concerned about producing better products and services than cutting costs, there would be enough jobs for everybody. Hopefully, this immigration debate will serve as the bridge between Blacks and Latinos because if you keep it real, it hasn’t really been robust. More importantly, Black people are not the judges of whether a “civil rights movement” is justified. I appreciate our unique history in this country but in the same way not “every” Black person was involved during the Civil Rights Movement, not every Black person have to take sides on the immigration debate. That is to say that not every quest for civil rights requires the involvement of Black people. I think Latinos have showed themselves to be quite capable or organizing themselves around this issue. As such, Blacks people’s presence or lack thereof, is not the deciding factor in determining Black/Latino relations. We have to define our own destiny. Every Holy Week, I try to do something to make it real to me. Some people prefer to watch the “Passion of the Christ” while others give something up for the Lenten season. Personally, I try to look at the events and life of Christ with fresh eyes and different perspectives. This year, I went to see the film “V for Vendetta” and a thought hit me: Christianity is arguably the greatest and longest lasting revolution in human history. When Jesus lived, the Jewish people were looking for a conqueror in the military sense. But Christianity became a cultural conquest. What made the Christian business model so sustainable? To the point where nations have been founded and toppled over this believe system purported by an obscure carpenter from Galilee? What does this say about the nature of revolutions at large and how can we incorporate this into our daily lives to effect change? Revolutions are defined by rapid change of the status quo. Most revolutions begin as movements. Movements are the groundwork for revolution. These are grassroots efforts to raise awareness of an issue. Revolutions can be violent, but these are not as sustainable because there is often no new order ready to take the place of the old. And often violent revolutions lead to mistrust and instability. A successful revolution occurs when people embrace and internalize the spirit of the revolution into their daily lives. The majority of successful revolutions are often referred to in spirit rather than actual events. For instance, history books often make mention of the American Revolution as the “Spirit of 1776.” The people identified strongly and understood clearly what they were fighting for and why change was necessary. The revolution changed the thinking of the people. This is why I believe Christianity, as well as any other major movement turned revolution, has been sustainable. It started by meeting people where they were with the intent of helping them realize their potential. Once people understand that they can be better, then they believe that their surroundings can be better too. And what’s more, they feel empowered to make it happen. At some point, you have to define what is worth fighting for. How much are you willing to let slide? What will it take for you to speak out against the injustice in your community, government and in your own life? How dedicated are you to the struggle, to change inside and out? These are questions we all must answer. And that is what Easter/Resurrection Season means to me. It is a constant reminder that there is still a lot of work to be done in my little corner of the earth. This is the purpose of these articles and www.thesuperspade.com. We want everyone to be aware and live the lives that the Good Lord intended. We challenge for us to use all of the tools at our disposal to do so. If a man armed with only a group of fishermen and some conviction can turn the world upside down, why can’t we? If we don’t, it is because the Spirit of Revolution, the spirit of change has been lost upon us. I cannot tell you how to fight your fight. I cannot tell you how to foment your own revolution. I cannot tell you how much to give. That is for you to determine. I can tell you this: The revolution will not be televised because no one can see what is in your heart. The world will not get better until you get better. Question of the Week: What does revolution mean to you and how do you choose to wage the battle within? By now, I hope no one believes that the reasons for invading Iraq were anything but fluff. However, as the truth slowly comes to light, we should be careful not to become desensitized to the enormous harm these mishaps have cost America in blood and treasure. Having said that, try to comprehend how brazen Bush is in his lying. “Leaders of the Pentagon-sponsored mission transmitted their unanimous findings to Washington in a field report on May 27, 2003, two days before the president’s statement.” Bush’s lie was when he claimed, “we have found the weapons of mass destruction.” To be sure, Colin Powell talked about these same mobile weapons labs in his testimony before the UN, but if you looked at the pictures, they just looked like empty trucks. What’s more alarming is that “the three-page field report and a 122-page final report three weeks later were stamped “secret” and shelved. Meanwhile, for nearly a year, administration and intelligence officials continued to publicly assert that the trailers were weapons factories.” The report was conducted by the Defense Intelligence Agency (which would have a clear bias in my opinion) which means that rather than the typical assertion that this whole debauchery is based on Bush receiving bad intelligence, Bush’s own civilian-led Pentagon had it right, but he ignored their findings. The previous story is eerily related to the other discovery that Bush was outed by Scooter Libby when Libby testified that Bush authorized the declassification of documents that resulted in the outing of Valerie Plame. This is wrong on many levels but I will only cover three for the sake of brevity. When the Valerie Plame story broke, Bush repeatedly asserted “If there’s a leak out of my administration, I want to know who it is. … I want to know the truth. Leaks of classified information are bad things.” But he is the one who authorized the leak!!! Secondly, it is disturbing that had not Scooter Libby forced Bush’s hand, it would have taken years before the truth came to light. Bush, if you are reading this post, lies of omission are just as bad as lies of commission. And lastly, Bush authorized the leak eight days after Plame’s husband, Joseph Wilson, criticized the administration for manipulating pre-war intelligence to exacerbate a war with Iraq. I have no doubt that as time progresses, even more lies will be accounted for, but in the mean time, I urge everyone not to get war fatigued. The people who wanted this war went to great lengths (and probably sold their soul) to make it happen so we who believe in justice and truth must meet and overcome this challenge. But it will take stamina so if you are tired, hopefully this post gave you some energy. I was expecting to see a lot of things and talk with a lot of people during my time in New Orleans. Much to my surprise, when I was finished checking into my hotel, I got on the elevator with a gentleman who had on a blue windbreaker that said “FEMA” (Federal Emergency Management Agency) on the back. At the time, I was on the phone with my mother, however I was able to get the man’s name. On Sunday, I had lunch at my hotel with him. Here is how our conversation went. The man, who was 51, was originally from Marrero, LA, which is on the West Bank not far from Gretna, LA (across the bridge). He fled the storm to a town just north of Nashville, where his brother lived. He and his brother returned to his home in Marrero, LA in mid-October only to find a pile of debris that was formerly his house. 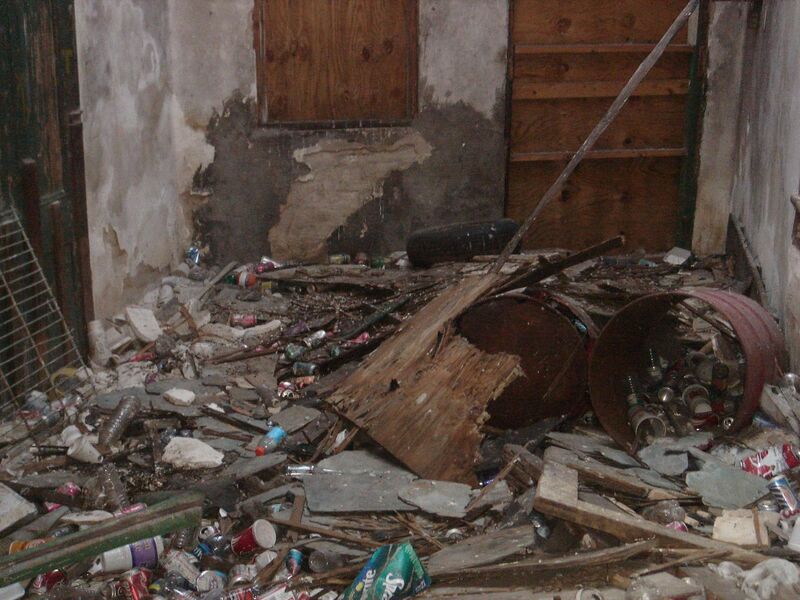 It was at this point that his brother encouraged him to seek out the help of FEMA to rebuild, since he had no insurance. They had already heard the stories of people not getting their money or any other kind of help, but they gave it a shot anyway. He called the office of Congressman William Jefferson to get a number by which he could contact FEMA. He then told them his situation, and that he’d do anything to be able to move back to Marrero and get his house back (he did own the home). He knew “God was on the phone with him” when the person on the other end said that he could likely be helped if he was willing to work for FEMA. He happily said he would, and BAM! He was now a FEMA inspector. The fact that he had no experience here did not deter him or FEMA from hiring him (he was a chef by trade, but the restaurant he worked in was destroyed by the storm). I asked what he did as an inspector, and he said he basically went to damaged/destroyed houses and make judgement calls on whether they were “recoverable” or not. I asked how they measured “recoverability,” and he said that they looked at “the damage of the other houses on the block, the structural damage to the building, how likely that area would be to flood again, stuff like that.” He also told me that they had “an engineer” accompany him when he went to look at the different sites. “We fill out a sheet for every house and then turn it in at the office.” “What was the ‘recoverability’ of your house?” I inquired. “Well, my house is gone, but I can afford to rebuild it.” I asked then if they took into consideration the “owner’s ability to afford rebuilding” when inspecting homes, and he said he didn’t know. “They know who owns the house back at the office, but I don’t know that when me and the engineer look at the house. I sure hope not.” He’s not the only one. The last thing I asked him was if he felt the New Orleans area was better prepared now for a storm this hurricane season. He said, “Hell naw. They ain’t rebuilt a levy yet that I know of. I plan on leaving again if they say a storm is coming. I’ll rebuild my house if no storm comes before my year is up.” I told him that we’d be praying together that no storms ravaged the area like this ever again. It was good to put a human face on FEMA. 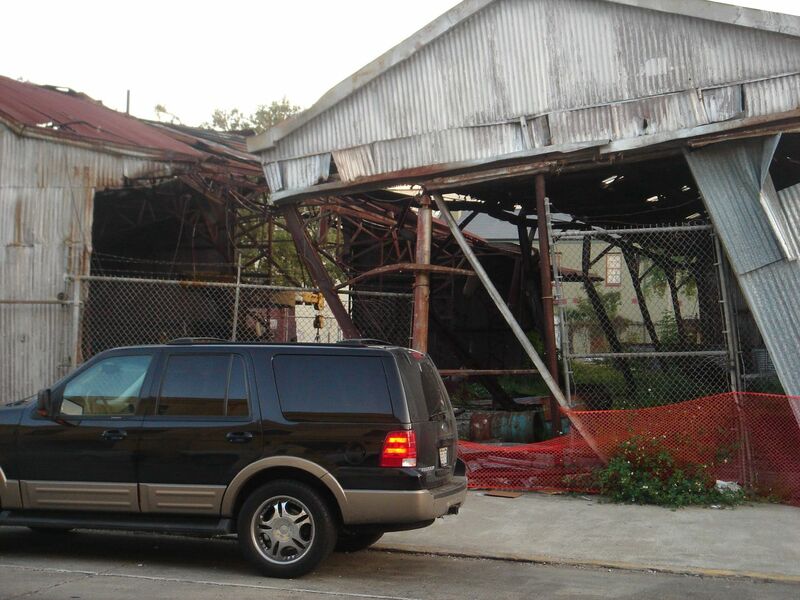 Here are some pictures of buildings that are damaged in the downtown area and have yet to be fixed. The most recognizable of these will be the Louisiana Superdome. 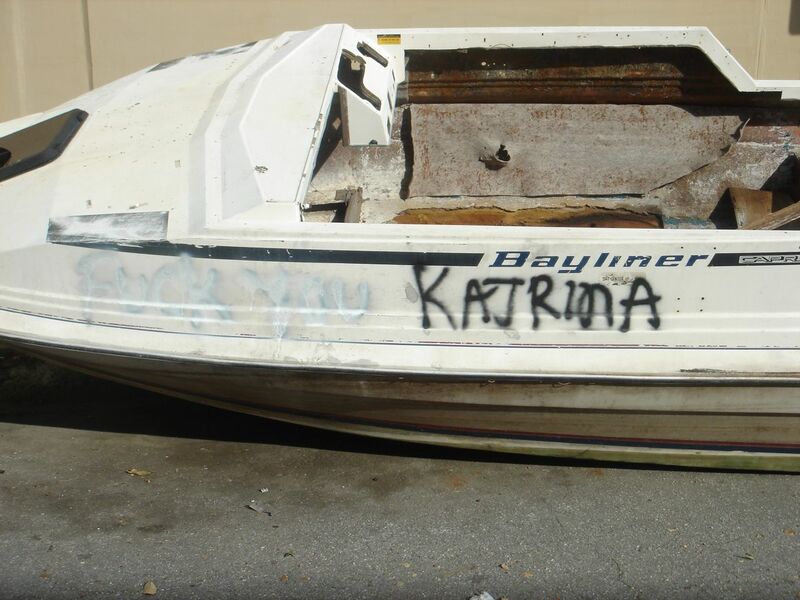 This boat was across the street (Poydras) from the Superdome. Can you read what’s painted on its side? That sums up a lot of residents’ feelings towards the storm. 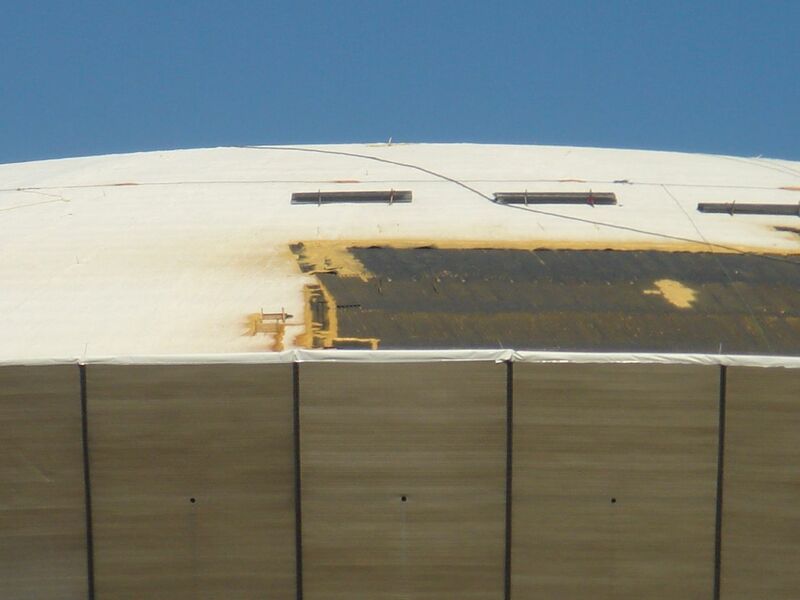 The hole in the roof of the Louisiana Superdome. 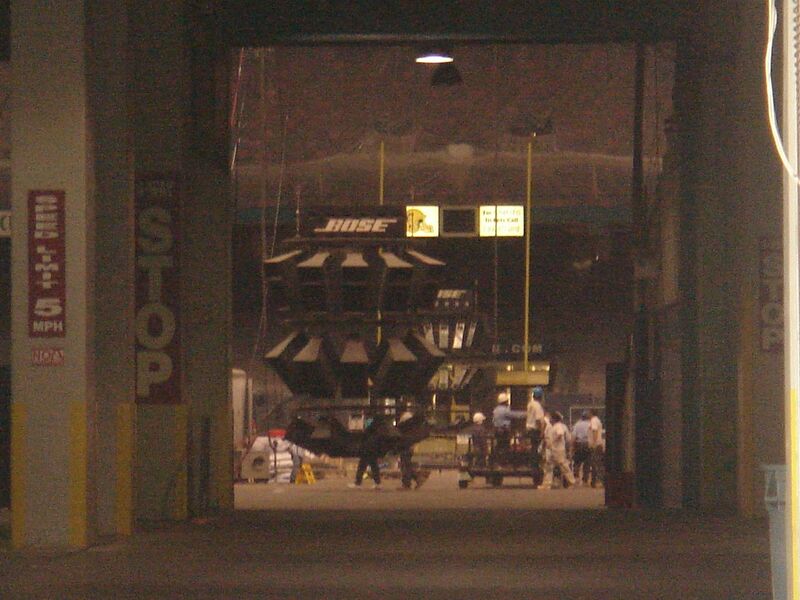 This is the best shot I could get of the construction going on inside of the Superdome. Security wouldn’t let me in. I thought I was a nice guy, but maybe I’m not that nice. 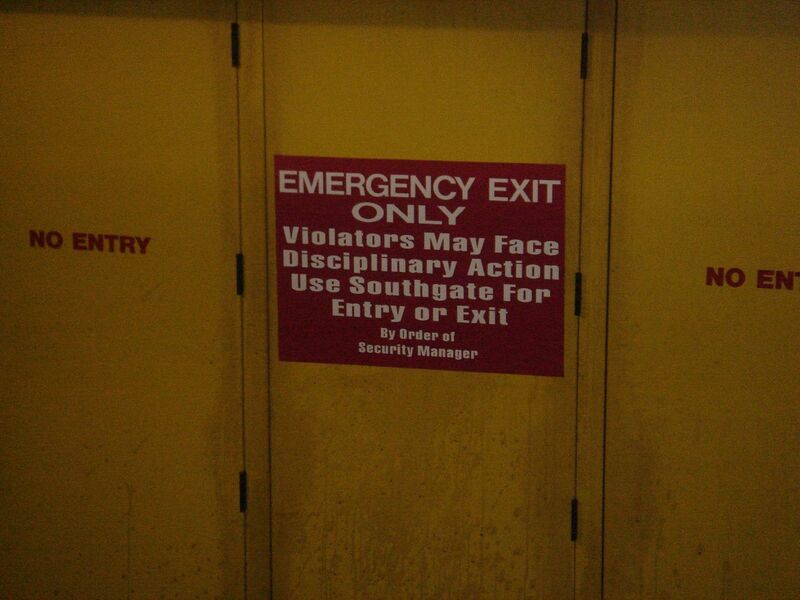 This is in the Superdome parking garage. I wonder why people who wanted to couldn’t get out? 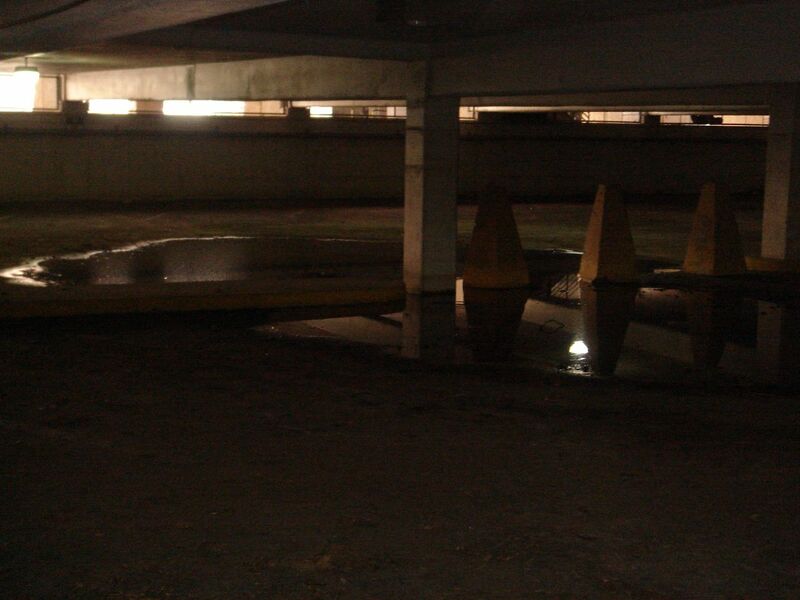 Large puddles of standing water remain on the interior of the upper levels of the Superdome parking garage. The lowest level still has about 3 inches of standing water, but the pictures were too dark. 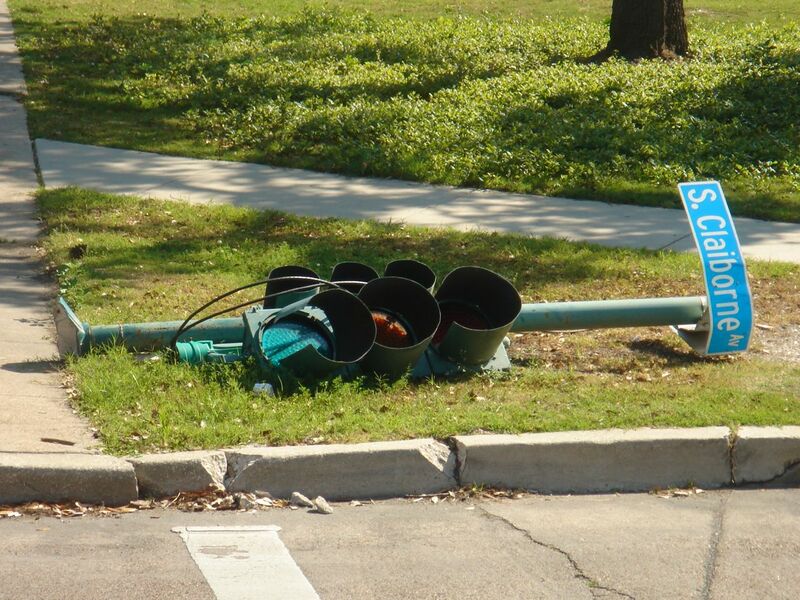 This traffic light is at the corner of Poydras and S. Claiborne, on the site of the Superdome. The New Orleans Centre is a shopping complex connected to the Superdome by a pedestrian bridge. 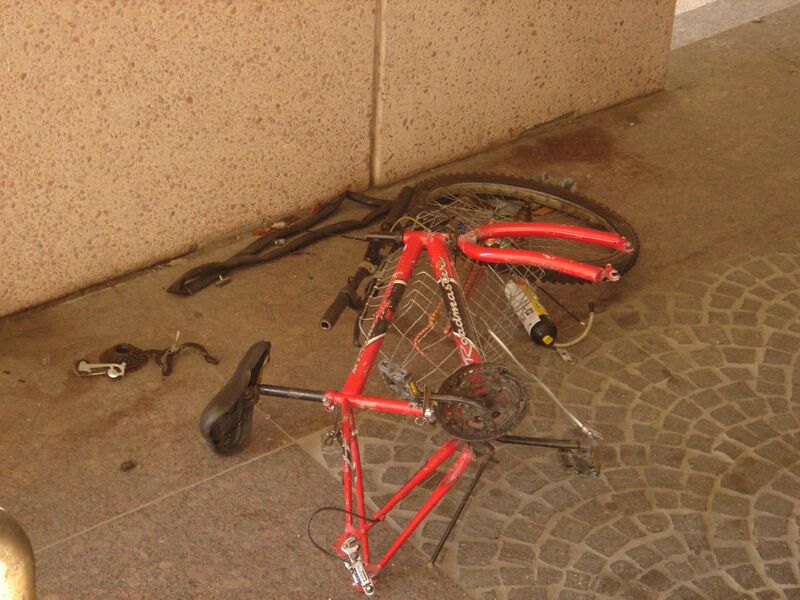 It sustained heavy damage and looks abandoned. This is its main entrance. 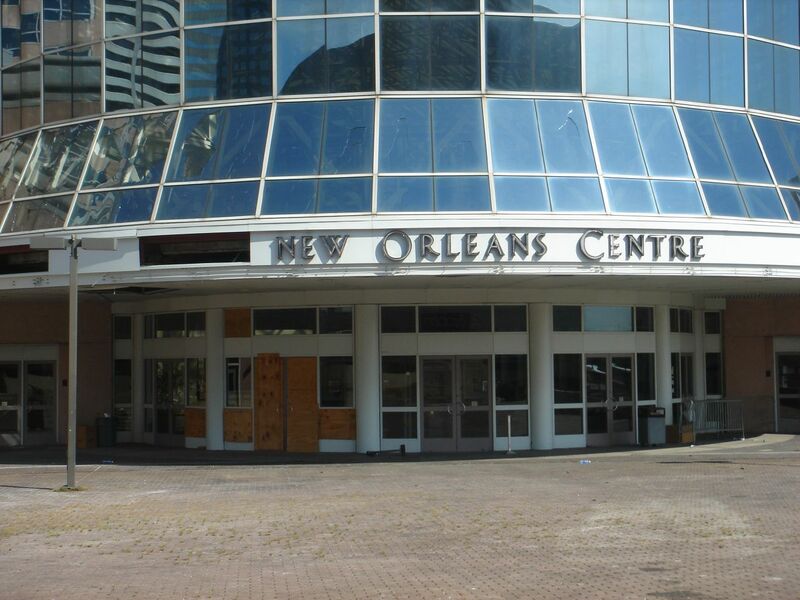 I was actually able to get inside the New Orleans Centre. What I saw brought me to tears. 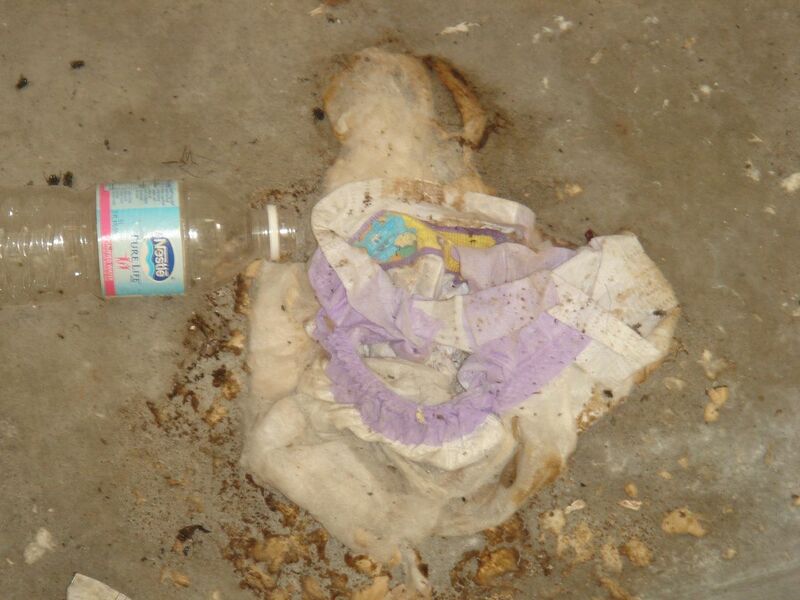 This is a little girl’s outfit. A boy’s bike at the New Orleans Centre. 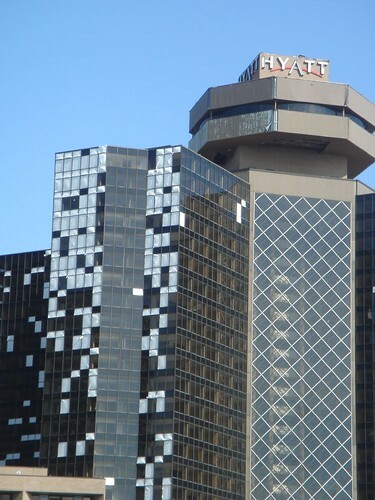 The Hyatt downtown. The lighter colored windows are the broken ones. 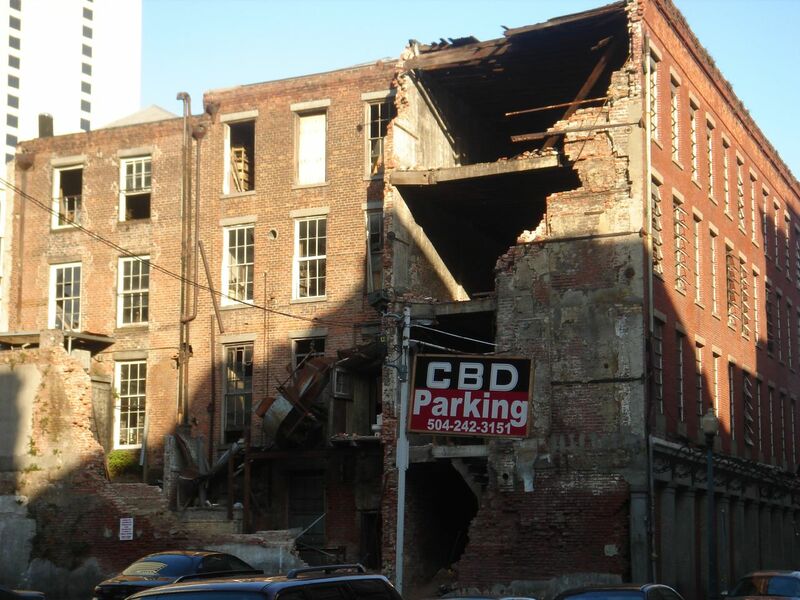 The remains of the building downtown that the 5 men I talked to lived in. This was right across the street from my hotel. This used to be an auto mechanic shop. 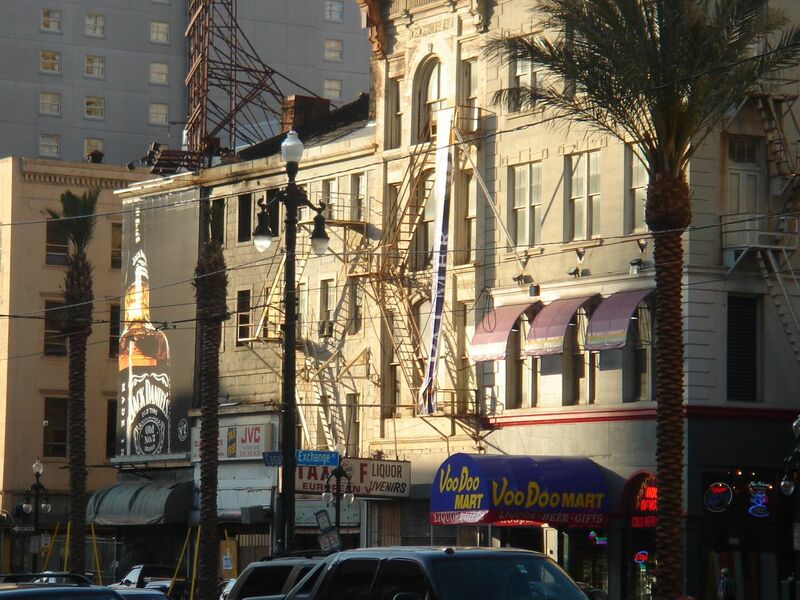 This is a pic of Canal Street, one of the main strips of downtown, especially during Mardi Gras and other Festivals. This pic shows how some things have recovered while others have not. Notice that the building on the right is back in business while the one on the left (and connected to it!) is abandoned and not yet fixed. 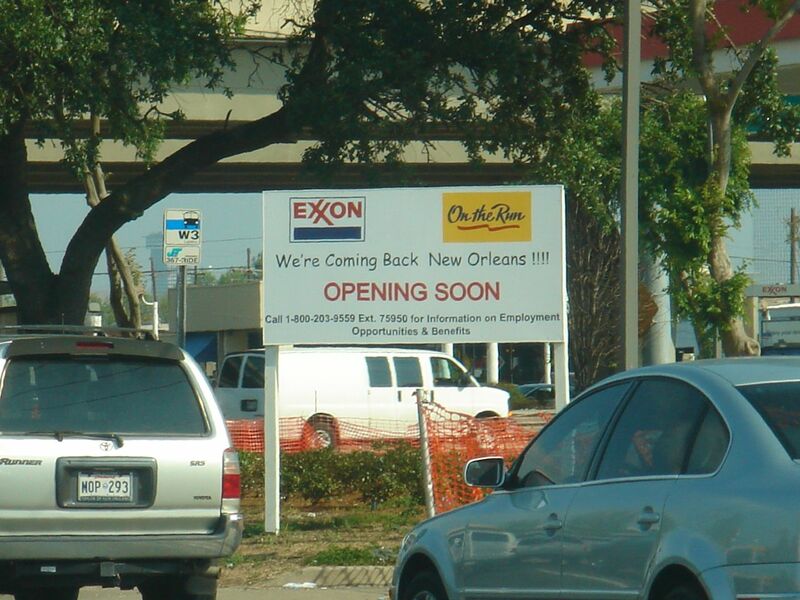 This was a store during Essence Festival 2005. Some businesses have pledged to return. All of the pictures I took of damage can be seen on my Flickr site.